As we say goodbye to the festival season, it must be time for another naked sauna party! 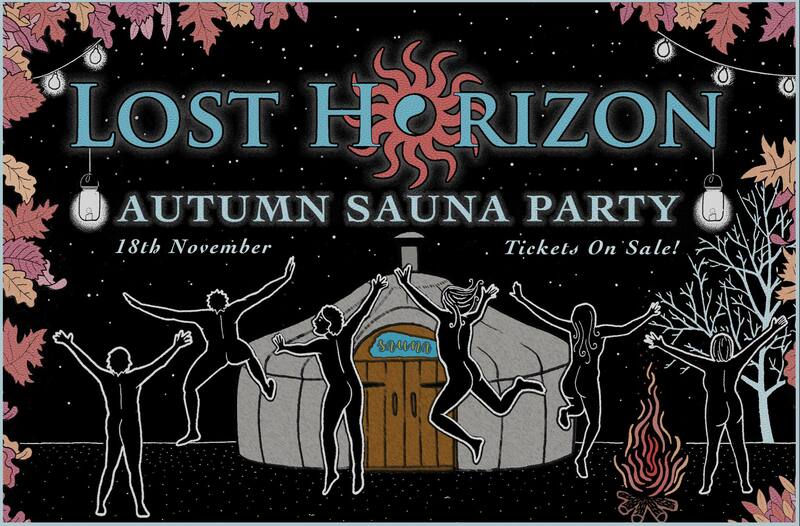 Lost Horizon are once again proudly collaborating with the Magic Garden, to rekindle the fire from a summer of saunas, sun and stomping good fun! What better way to welcome in the winter than with your heart and soul beaming from the warming glow of the sauna. Meet friends old and new in the place that brings the best of that festival vibe to the city, dance til the early hours with a show-stopping line up of live bands and DJ’s. Summer festival vibes return to the city! This is an incredible sauna experience under the London stars. Come and join us in the huge bohemian garden with comfy sofas, colourful cushions, twinkling fairy lights and flowers and The Magic Café – a magical place to eat, drink and laugh to your heart’s content including snuggly blankets and hot water bottles. Be entertained by festival faeries under the stars and warmed by the fire. The spa area will be tucked away in a secluded naked friendly section of the garden. The luxurious yurt sauna will be sizzling from 7pm – 2am. Garden closes at midnight, spa continues ‘til 2am. Enjoy a truly unique, fun and fabulous night of music and saunas under urban skies. Tickets available on the door – for guaranteed entry book now! Includes entry to The Magic Garden and Spa. This South-London super-group have been bringing calypso beats to the city streets all year, and will be kicking the evening into full swing with some slamin’ steel pan based tropical vibes! Pangaea Steelband will be cooking up a storm of hot Caribbean jazz licks to get the party started! Matuki are a 12 piece band who play west African music fused with urban funk. They’ve been winning audiences over with sizzling horns, tuff bass-lines, interlocking guitars & soaring vocals since their first gig at Glasto ’15. Led by master drummer and lead vocalist, Abraham Ebou, they fuse Afrobeat with full on urban funk as well as jazz & psychedelic influences too! We’re Super excited about this one! Festival favourite and Magic Garden resident DJ Ruth Bloomers returns with her legendary mix of music to help warm away those winter blues…….From Electro Swing and Groove to R’n’B and Jive, Ruth will surely be rinsing the tunes on the dancefloor to help keep your feet stomping into the early hours! Described by many as a festival within a festival, Lost Horizon is truly unique. A hidden garden oasis incorporating a luxurious wood-fired yurt sauna, cosy tipi and live outdoor stage, it’s an area where people can be naked and free around open fires. Our garden is a well held and body positive space that festival goers have come to rely on. Key to this is our large amazing crew of talented magical creatures, all the while keeping our wristbands at an accessible price. The trouble is, that’s not how you make money! Saturday 18th November sees us return to the lovely Magic Garden in Battersea and your presence will help ensure we get to the 2018 festival season.